A new resource is available, a Protected Membrane Roof (PMR) Planning Guide, representing more than 50 years of proven assembly experience across the globe and 35+ years of Hydrotech’s industry knowledge. 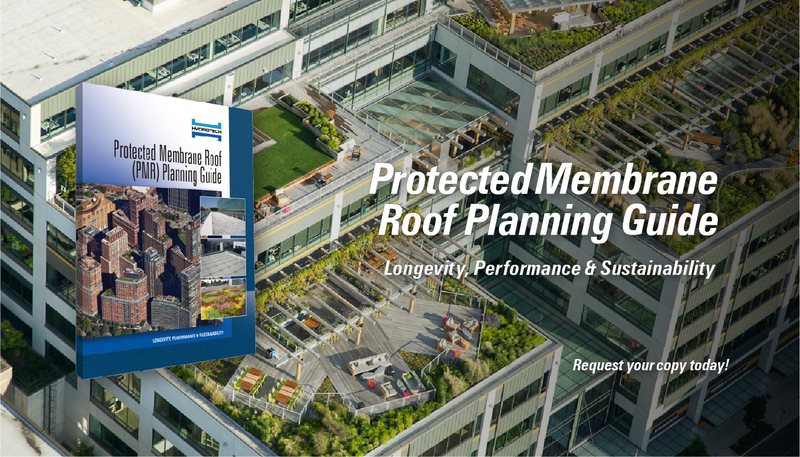 The guide strives to educate architects, engineers, general contractors and other design professionals on the key benefits of a protected membrane roof compared to a conventional roof, currently available technology, and best practices for effective installations. Hydrotech's Garden Roof® Assembly allows the design professional to transform virtually any flat or sloped roof into a landscaped environment. Designed as a lightweight, low profile system, the Garden Roof Assembly can be safely installed on roof and plaza decks not engineered to handle the heavy load requirements of a traditional green roof. And because the assembly incorporates Hydrotech's Monolithic Membrane 6125®, a proven roofing/waterproofing membrane, the building owner can be assured of a water-tight structure. Hydrotech's Monolithic Membrane 6125®, the original rubberized asphalt membrane, has been entrusted for over 45 years with keeping high profile structures across the country and around the globe watertight. With almost two billion square feet of MM6125® installed, one could say that Hydrotech is recognized as the leader in the waterproofing industry. Not satisfied to rest on our past successes, we have developed a full range of thermal and moisture protection products, drainage systems, Plaza Deck Assembly® for plazas, decks and roof terraces, and the Garden Roof® Assembly for green roof applications. The popular Garden Roof® Planning Guide – American Hydrotech's comprehensive guide to vegetative roofs – is available for free as an iPad, Android, and Windows tablet app. The Guide covers everything from technology and materials to proper planning and design, installation, and maintenance – from concept to completion. It features high-resolution product photography, video animations, photo galleries showing Garden Roof® Assemblies in real-world applications, design considerations, and more.